E-News Archive – catch up here! This article is addressing one of the most important aspects of your LinkedIn Company Profile and that is the Products and Services. Product or Service – this just tells LinkedIn whether you are selling a product or providing a service. Name of item – Try to use a keyword here. Photo – when I work with clients, I brand the images of all products to reflect the same appearance. Description – You have 2000 characters or about 375 words depending upon size. Use keywords. URL – do you have a landing page for this product? Don’t make the person search your website. Contact – you can add 3 LinkedIn company contacts. Do you have a regional sales manager or local person that they could contact. Does that person’s profile provide proper contact information? Promotion – is there a promotion on your site? Maybe a LinkedIn discount landing page. Video – YouTube gets 4 billion searches per day, but a consumer may not be searching for your product on YouTube. Video URL – share the video link from YouTube (Vimeo may work as well) and a video link will show in the product item. Disclaimer – Include any restrictions that you need to share with a potential consumer. What a product on LinkedIn can do is drive consumers into your website or to your salespeople. 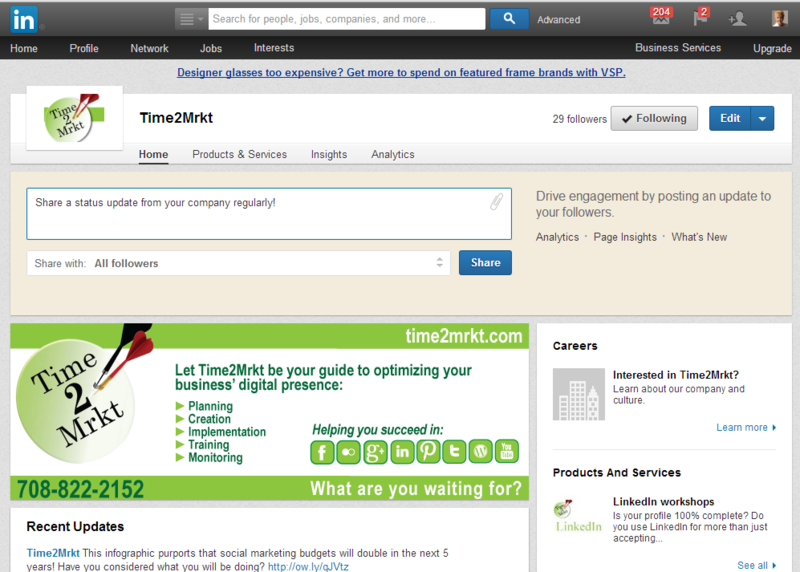 Additionally, you can direct connections or LinkedIn users to write a recommendation for a specific product. This helps build the credibility for your product instead of just for you or your employees. Let me know if I can help you boost your product awareness on LinkedIn. Do you have an email address at that domain name? Do you have a company LinkedIn page? How many of you are 3 for 3? I still run into people who have been doing business very successfully without a website. Many of them are hyper-local and do most of their business by word-of mouth. But if you have ever watched Eric Qualman’s Social Media Video? Your growth depends upon “World-of-Mouth”. When you have a website, you validate your authenticity. By taking it one step further and having a company LinkedIn page, you increase your authenticity, but you increase the likelihood of showing up higher in search results. If you want to take advantage of all of the bells and whistles, you will need some graphics to optimize the profile to the fullest and the time to create a listing of your products and services. This gives you in-bound links that also help drive up your website’s SEO. 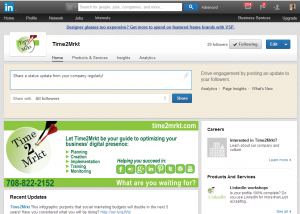 Last but not least, if you are creating a company profile, you will want followers. To keep them interested, you will more than likely need to post some interesting information about your company or industry. Get a twofer by sharing your company update to your personal connections! Need to know more about that? Check this post. Does all of this sound overwhelming? Give me a call. I just read in a white paper that blog writers should be posting at least 3, yes you read that right, three times a week. In essence what this does is helps to drive your search ranking higher in the search engines. For example, the bots come to your website on December 1, they don’t return to your site for 30 days. If the bots see that you have more activity, they re-calibrate and return more frequently causing your pages to rise in the search engines. This helps you with your website optimization by raising your ranking naturally in the organic searches. So, how often do you post? Once, twice, three times (a lady by Lionel Richie) a week, according to that logic, the more you post the better for your rankings. When was the last time you went past the first page of search results when you entered a keyword? When was the last time you clicked on a “sponsored” search result? Make sure your page titles are unique, tagged and categorized, especially if they are blog posts. 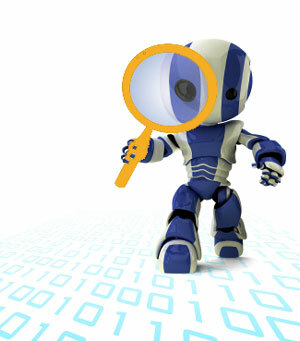 Ensure your metadata, descriptions and keywords used in text are all similar. Another help to edging you up in the rankings are backlinks. You can build them yourself by adding the various social media sites and adding your website to that line in the profile information. Another way to build backlinks is to provide useful comments on others blogs and include a “link back” to your site. I have seen services on the web that will sell you the service to help you build the back links, but is it worth the potential scam possibilities? SOOO, how many times will you be blogging from now on? Author DeeReinhardtPosted on December 13, 2011 Categories WebsitesTags backlinks, organic searches, search engine optimization, SEO, social media1 Comment on How often do you post? 708-822-2152 Sign-up for our newsletter! Dee and I have worked together successfully since I have been in the Elgin area, and she has been a phenomenal resource. By assisting me in learning to better utilize social media, especially Linked In, I have been able to establish new business contacts, and reconnect with former associates. She is an excellent teacher, and trusted colleague. Dee Reinhardt is a high energy professional with many tools to help move your business forward.